Tim and I just returned from a week in Kyoto. We walked every day (most of the days 30,000 steps according to our iPhones) and by the time I got home, many of the temples, shrines, and gardens were a blur. Some of the temples and gardens were chaos! Hoards of school groups were visiting Japan’s most famous and revered places. The screaming, shouting, running students did not fit my preconceived notion of the Japanese garden experience. But when I look at my pictures, the gardens are serene and calm. I could turn my camera’s eye to stone lanterns, still ponds, and trees starting to show hints of scarlet. 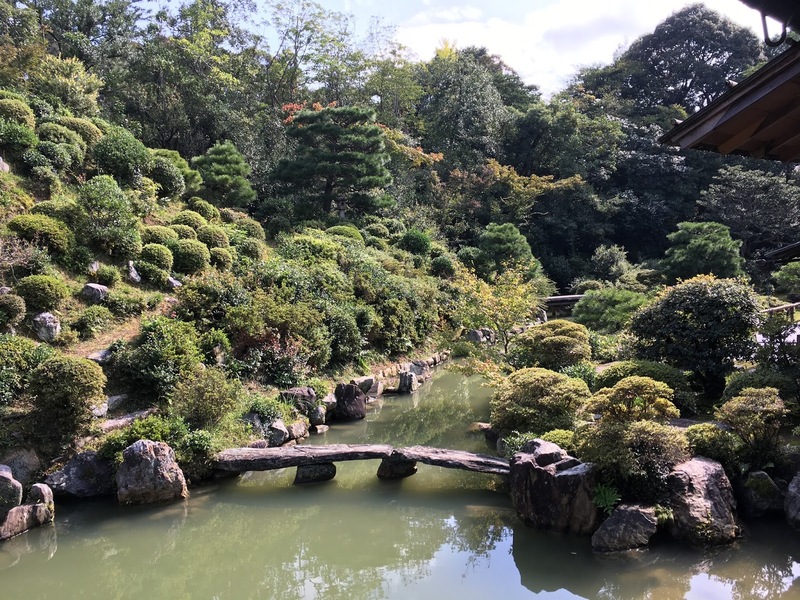 Japanese gardens are the essence of peacefulness. It is an art form like nothing I have ever experienced. 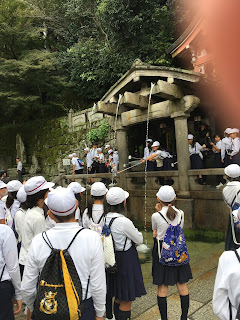 Students waiting to drink from the sacred spring of water. I focused my camera on the quiet beauty of the garden. 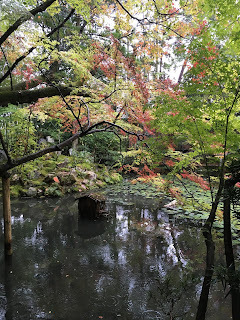 When I was in the Japanese gardens of Kyoto, I found my senses heightened. I noticed beauty in both the overall design and the small things: a moss covered lantern, a pine tree branch that twists and turns gracefully—shaped by hundreds of years of skilled gardeners, a path of boulders in the middle of a pond inspiring the viewer to stop and admire the brightly colored koi swimming in the still water. 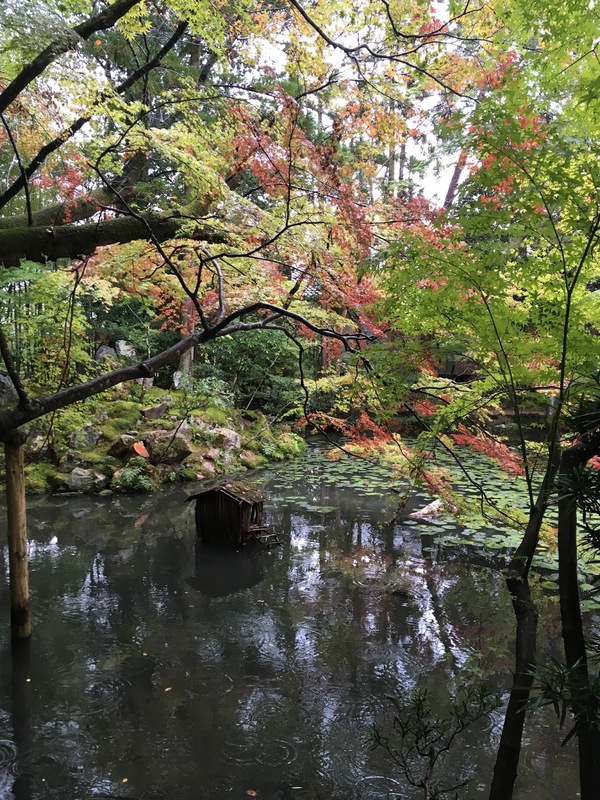 My favorite garden was Eikan-do with its small magical pond hidden away from the bustling crowds. There were not many visitors and we were cast under the spell of the gentle rain, the green lily pads, the branches that hovered over the water with leaves starting to turn red. A small wooden structure that looked like a miniature cabin was placed in the middle of the pond. I paused to ask, "Who lives there and what is its purpose?" 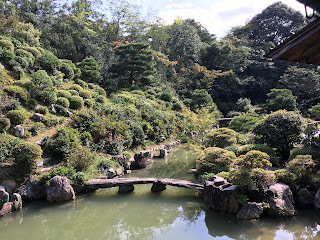 Eikan-do is a garden off the Philosopher's Path. A new concept for me was the importance of sound and movement. I took videos sometimes because the sound and the movement was essential to understanding the garden and its experience: green, yellow, orange, white, and purple brocade banners fluttering in the wind, water slowly poured from a bamboo cup into a deep well resulted in a soft, xylophone sound floating up into the air, water overflowing from an urn was directed down one leaf to make a thin stream of water. Needless to say, I’m sure there is a metaphor hiding in these gardens for my life. 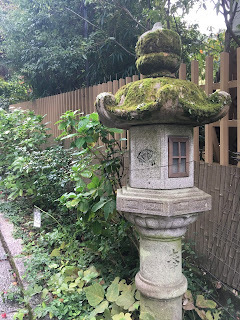 Sometimes Tokyo, the demands of teaching, politics at home, and my own busy mind make it hard to turn away from the traffic noise, worries, or thoughts that won’t quit. 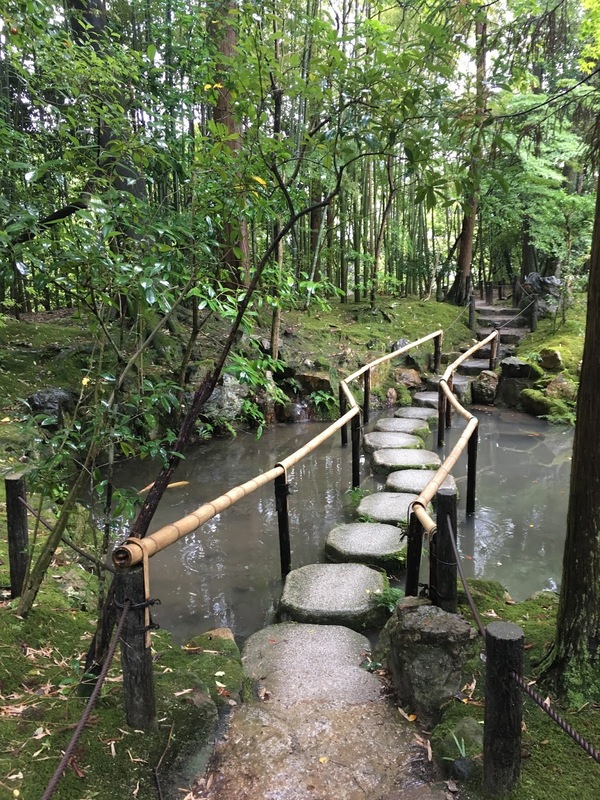 I think the gardens in Japan are beckoning me to put aside the chaos. Focus on the calm, take a deep breath, stop and notice the beauty.